There are many jobs which fall into this category of work. Here we were excavating a service trench for 3 flats and a shop conversion in a brown field site. Very often in these circumstances only light plant and physical effort to complete the task is practical. Of course pre-commencement risk assessment, ground survey and all reasonable precautions are taken. Encouraged by the promise of one day finding "buried treasure" in the process all our team approach these sort of tasks with great determination to get the job done. Sometimes groundwork can be completed far more efficiently. Right is an excavation for a rainwater soakaway. 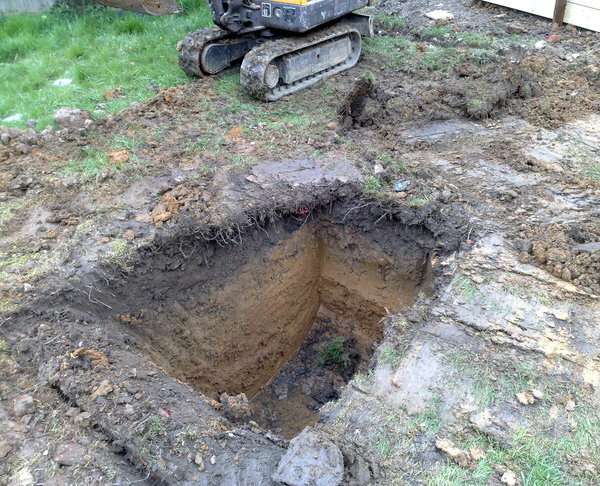 With the selection of the most appropriate size digger bucket this 1m square 1.5m deep hole took only 15 minutes.